The effect of bariatric surgery on the glycemic control of patients with obesity and type 2 diabetes mellitus is obvious. However, the effect in patients with body mass index (BMI) < 30 kg/m2 especially Asian population has not been widely reported and acknowledged. We performed a literature search in Medline, Embase, and the Cochrane Library from January 2000 to March 2018. All the studies involving the effect of bariatric surgery on patients with type 2 diabetes and BMI < 30 kg/m2 from Asian countries or regions were included in this meta-analysis. Twelve studies including 697 patients were examined in this meta-analysis. Clinical indexes in 6, 12, and 24 months follow-up were analyzed, respectively. BMI and waist circumference reduced by 2.88 kg/m2 and 12.92 cm, respectively, at 12 months postoperatively. There were reductions in fasting plasma glucose, 2-h postprandial plasma glucose, and glycated hemoglobin A1c at all the three time points after surgery, 3.13 mmol/L, 5.46 mmol/L, and 2.13% at 6 months; 3.22 mmol/L, 6.46 mmol/L, and 2.38% at 12 months; 1.99 mmol/L, 5.84 mmol/L, and 1.58% at 2 years. Insulin only reduced by 1.70 μU/ml at 12 months. C-peptide reduced by 0.70 ng/ml and 0.40 ng/ml at 6 months and 2 years. 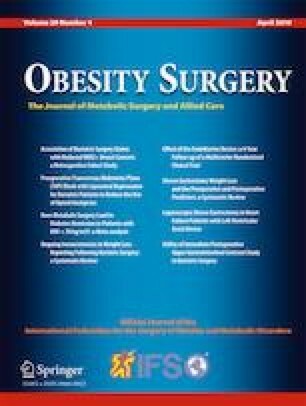 Bariatric surgery led to reduction in total cholesterol, triglyceride, and low-density lipoprotein cholesterol, while augment in high-density lipoprotein cholesterol at 6 and 12 months. Glucagon-like peptide 1 increased by 2.48 pmol/L and 4.00 pmol/L at half a year 1 year. Asian patients with type 2 diabetes and BMI < 30 kg/m2 could achieve significant improvement in weight, glycemic control, lipid profiles, and β-cell function in short and medium terms after bariatric surgery, but long-term follow-up is necessary to evaluate the effectiveness. The paper was supported by the National Natural Science Foundation of China (81600431) and the Natural Science Foundation of Hunan Province of China (2017JJ3471). Korea Health Statistics 2010: Korea National Health and Nutrition Examination Survey, the Ministry of Health and Welfare; 2010. http://knhanes.cdc.go.kr. In.